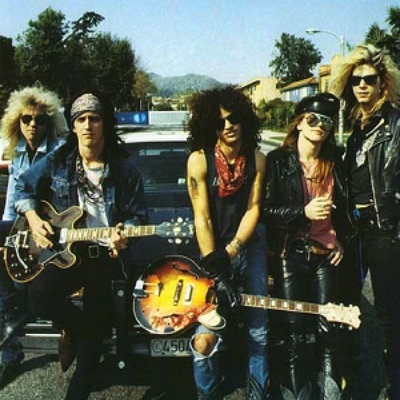 Guns N' Roses is an American hard rock band founded in Los Angeles, California in 1985. They are often credited with reviving the sleazy side of rock n roll and called "the world's most dangerous band" because of their volatile live shows. The band has released six studio albums: Appetite For Destruction in 1987, Gn'r Lies in 1988, Use Your Illusion I and Use Your Illusion II in 1991, The Spaghetti Incident? (a covers album) in 1993 and, after 15 years and with only one member of the original lineup remaining, Chinese Democracy in 2008.